"We are refugees … we are Hollywood refugees," Evi Quaid told "Good Morning America" in an exclusive interview. They are "seeking to be left alone by the criminals in America." "Dennis is now on a treadmill of making movies that are garbage and it's unfortunate because he's talented," she said. Also in danger, according to the Quaids, are troubled celebrities like Mel Gibson, Lindsey Lohan and Britney Spears. "I think he was drugged. I think he was slipped a Mickey," Evi Quaid said of Gibson. "It's possible for people to gain control of every facet of your life," Randy Quaid said. "They are business men," Evi Quaid said. "It's the mafia, it's organized crime." The couple is due in a California court tomorrow, but it's unclear whether they will show. They insist that they didn't flee to Canada to avoid charges in California, where authorities say they also skipped out on thousands of dollars worth of hotel bills. "We're just trying to find some safety and security in this," Randy Quaid said. 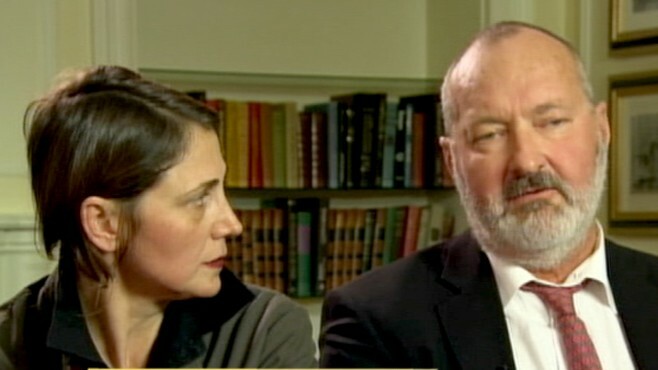 Though Randy Quaid grew frustrated with his wife during the course of the interview -- even once shouting at her "Evi will you shut up, please!" -- he said their life on the run has only brought them closer. "We're confronted with our true beliefs, our true values," he said. "Our very existence is being challenged and we feel very alive." The Quaids were released from a Canadian detention facility on Wednesday after Evi Quaid, whose father was born in Canada, was declared a Canadian citizen. Randy Quaid said he plans to look for work in movies and television from Canada. Quaid is well-known for his roles in the "National Lampoon" series of comedies as well as "Independence Day" and "Brokeback Mountain," for which he earned an Oscar nomination. The couple has been married since 1989.